Strengthens the spine, opens the chest, improves spinal flexibility, stimulates the thyroid. 3) Lift the hips up towards the ceiling. 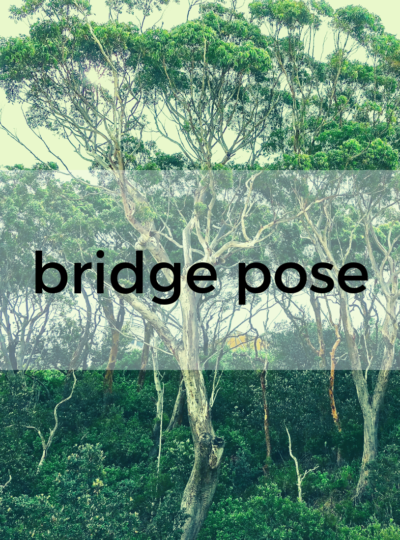 4) Interlace the fingers behind your back and straighten the arms, pressing them down into the mat. 5) Roll one shoulder under and then the other. 6) Lift the hips higher. 7) Draw the chest toward the chin, but do not move the chin toward the chest. 8) Make sure the feet stay parallel. 9) Release the hands and bring the upper, middle, and then lower back down. For a restorative variation, bring a block under the sacrum. Let your weight rest on the block. When coming down, keep the hands interlaced under the weight of the body for a shoulder opener. Try relaxing the buttocks while keeping the thighs engaged in order to lift the hips higher. Come into the pose from shoulder stand.